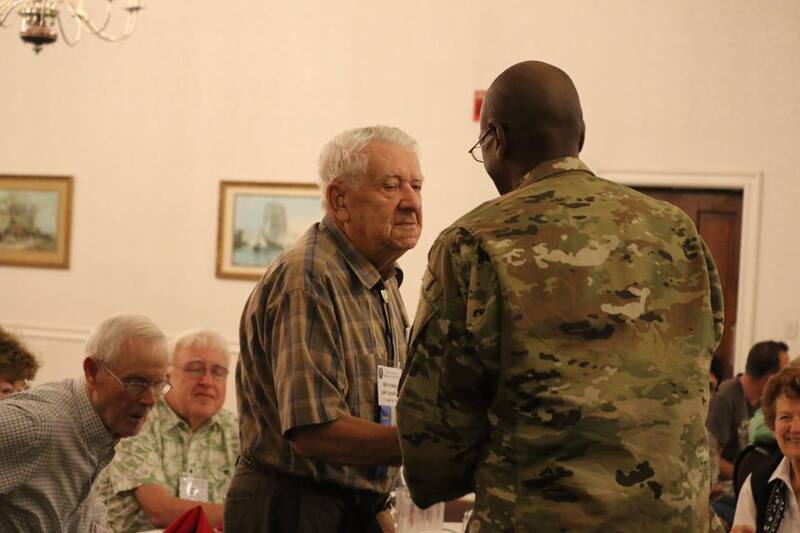 Veterans of the 106th Infantry Division and their families and friends joined together for their annual reunion in Washington DC in early September. The reunion was hosted at the Sheraton Pentagon City. The reunion, which was joint together with the National Timberwolf Pups Association’s (104th Infantry Division)’s annual reunion was chock full of meals, tours, and special events. Beginning on Wednesday afternoon, reunion attendees began to arrive at the Sheraton Pentagon City where registration was held from 2:00pm- 6:00pm. Following registration, the 106th Infantry Division members had a Meet & Greet Mixer with the 104th Infantry members and spent time swapping stories in the hospitality room. A highlight of the reunion was the group’s trip to Ft. Meade and the Holocaust Museum. Fort George G. Meade is an Army base that includes the Defense Information School, the United States Army Field Band, and the headquarters of the United States Cyber Command and National Security Agency. Originally opened in 1917, Ft. Meade has a rich history serving as a recruit training post and prisoner of war camp during WWII. Interestingly, many members of the 106th spent some time at Ft. Meade when active in the United States Army. The group enjoyed lunch at Club Meade, a base dining facility, and had a guest speaker visit with them as well as members of the band and active duty Army members present the Colors. After lunch, the group visited the Holocaust Museum, America’s only national memorial to the Holocaust. The museum which was established by a unanimous Act of Congress, contains a permanent exhibit of artifacts, films, photographs, and oral histories that document the Nazi genocide. Upon returning from their Thursday tour, members had a little bit of time to rest and clean up before their Welcome Dinner, which was followed by an evening of fun spent in the hospitality room. Friday morning began with the group’s Memorial Service followed by a Combined Men and Ladies Luncheon and Business Meeting. Friday evening wrapped up with a trip to see Shear Madness at the Kennedy Center. Saturday morning members of the 106th Infantry and NTPA boarded buses to take in the sites of Washington on a Memorial Tour. Stops on the Memorial Tour included the Lincoln Memorial, Korean War Memorial, Vietnam War Memorial, U.S. Navy Memorial, and the World War II Memorial. The reunion wrapped up on Saturday night with a Cash Bar Reception and a Banquet Dinner.